nicely and there are videos to help you along the process. 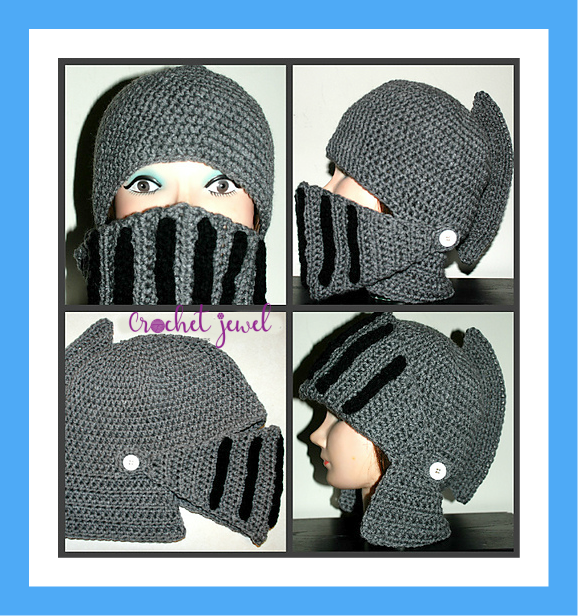 How to Crochet Boy's and Man's Knight Helmet Hat Videos! This is made for a 10 year old boy. Instructions: J hook ch 4, sl st, to form a ring. row 30. With grey yarn, Slip Stitch into the first 2 hdc, Chain 5, Slip Stitch in the same stitch as the chain 5, Slip Stitch into the next 2 hdc, Turn, Slip Stitch back into the next hdc after you turned, then Slip Stitch into the Chain 5, ch 1, work 12 hdc into the ring, Slip Stitch in the chain 5, Slip stitch into the next hdc. Fasten off. Weave in the ends of all your black and grey yarn. Make 2 of Each. Chain 18, work sc in the 2nd chain from the hook and each stitch across, slip stitch into the last stitch. Fasten off. Chain 14, work sc in the 2nd chain from the hook and each stitch across, slip stitch into the last stitch. Fasten off. Now Take the Two Chain 18 Strips and Sew them onto the Mask, Fold the Mask in half (This will help you find your center) and sew the black strip onto the center side by side about 1 inch apart. Now Take the Two Chain 14 Strips and Sew them onto the Mask, Sew one Chain 14 Strip on one side of the Chain 16 strip about 1.5 inches apart and Sew the other Chain 14 Strip onto the other side of the Chain 16 strip. I love your pattern! I am making one for a boy around 5-7 years old how can I decrease the pattern to make it fit from a 10 yr old to the 5-7 yr old?